Photographing the Roehr at Malibu Beach, Apple was glad she remembered to wear her swimsuit for a cool dip in the ocean afterwards. The final finished result shown here, the Roehr 1250SC Supercharged, is now in limited production for customer ordering. 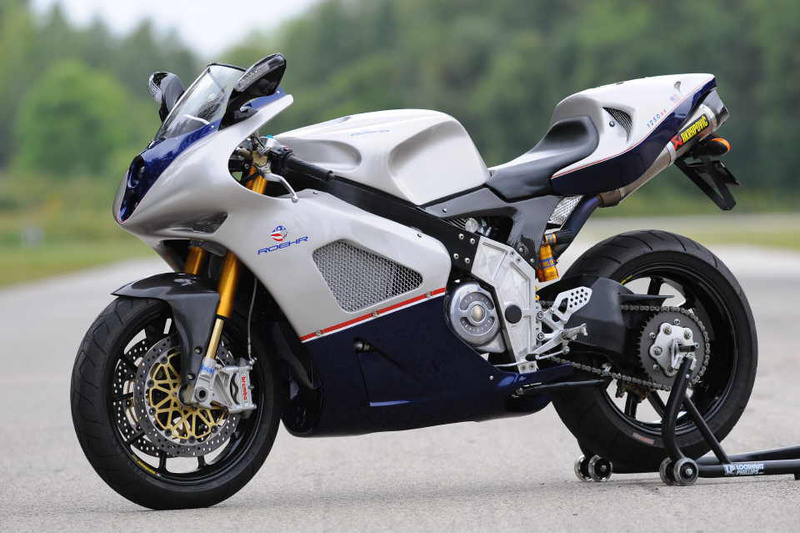 The bike is certainly beautiful, a well thought out and tested design, individually hand built and equipped with the best components like a high end Ecossem Confederate, MV Agusta or Ducati 1098R Superbike. It's priced accordingly at $49,999 which is actually very reasonable. The finished production bike we got to test has carbon fibre rear subframe covers hiding the aluminum structure, a full Akrapovic racing exhaust system, and two big radiators, one on each side, and a big oil cooler, all neded to cool the big twin which was designed to produce less power and heat and be exposed to the open air for additional cooling from its cylinder fins, now hidden behind a full fairing. Photo curtesy Alan Cathcart / Roehr. 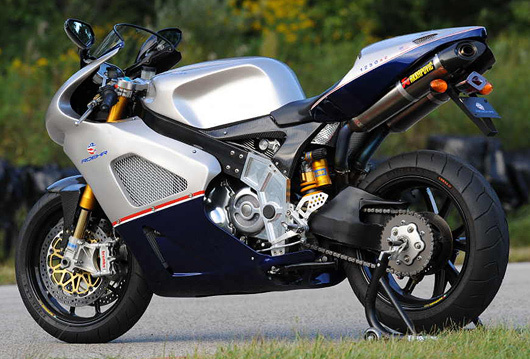 The Roehr 1250sc boasts high-spec running gear – Ohlins suspension, Marchesini alloy wheels, Brembo brakes with radial-mount calipers at the front, composite bodywork The single sided rear swingarm and rear wheel hub / brake / sprocket assembly was obviously soured from a Ducati Superbike. 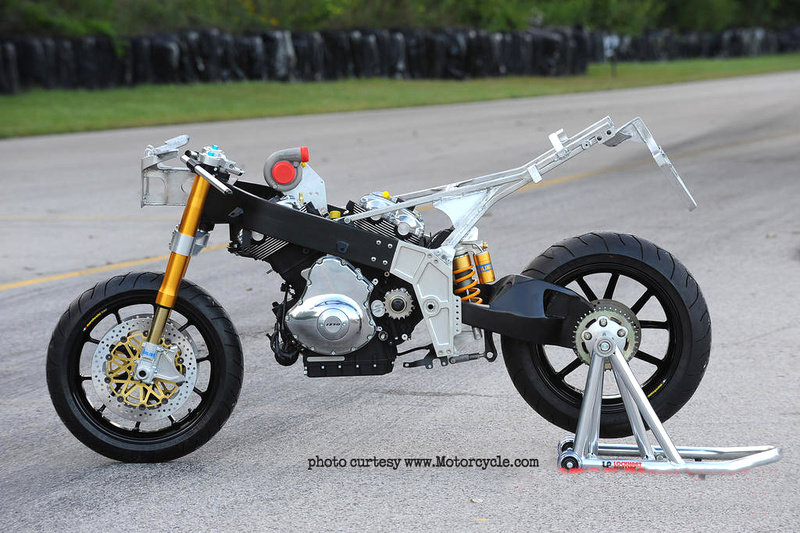 Is the Roehr 1250SC a serious sport or racebike? Not really. It doesn't fit in any race class with its oversized engine and supercharging charging. And it's some 20-40 pounds heavier than the competition thanks to it's cruiser based Harley V-Rod engine. And a disconcerting thing for race track use is the shallow wet sump oil pan on the street touring bike engine that isn't designed to pick up splashed about oil under high G-loads from braking, acceleration, cornering, and least of all wheelies. 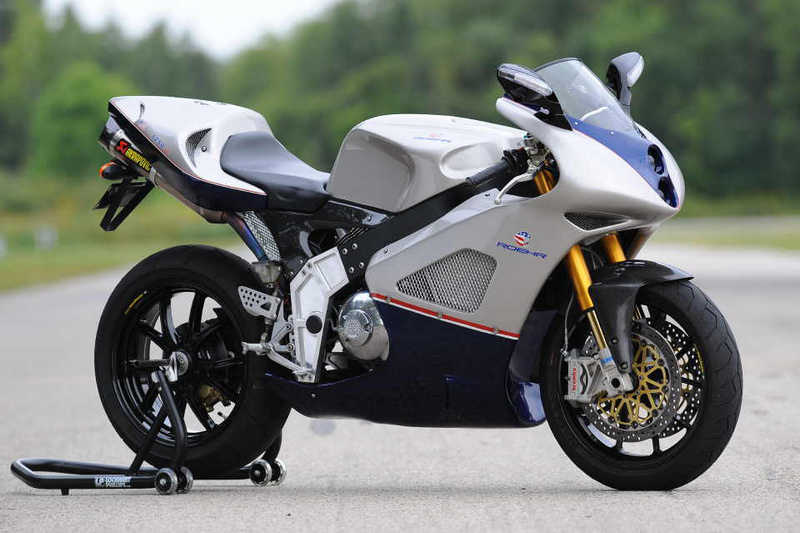 And the bike's $60,000 price tag will have you think twice about riding it hard enough to risk pitching it down the track. Where the Roehr will find a niche though, is among wealthy motorcycle collector enthusiasts (Jay Leno and Tom Cruise, to name a few) who own a stable of unique high end bikes, machines like the exotic American V-Twin powered Ecosse and Confederate naked custom sportbikes, or the Italian Bimota with their unique chassis and high-end suspension components. In this respect the Roehr sits right in as a cruise night, Rock Store or Alice's Restaurant attention getter. It's only big marketing drawback is unique supercharged V-Rod engine unit that is hidden from view behind the full fairing and under gas tank. And the MotoGP clip-on handlebar riding position that's no longer practical for middle age millionaires. Marketing wise, it might be a good idea to also offer a high handlebar naked bike version of the Roehr, similar to the Aprilia Tuono and Ducati Streetfighter, which puts the supercharged V-Rod engine on display for all the world to see what makes your bike so unique, and expensive! 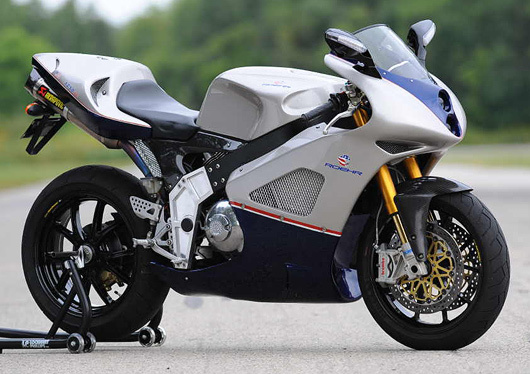 The Roehr 1250sc boasts high-spec running gear – Ohlins suspension, Marchesini alloy wheels, Brembo brakes with radial-mount calipers at the front, composite bodywork and is powered by the 1250sc 180HP, specially developed supercharged version of the Harley Davidson* 1250cc Revolution* engine. State of the art supercharger technology has been applied, providing reliable high power output with a broad, linear power delivery. 2 x 330mm semi-floating discs, radially mounted Brembo 4 piston calipers. Look for Apple and the Roehr featured in the 2011 FastDates.com Calendars! 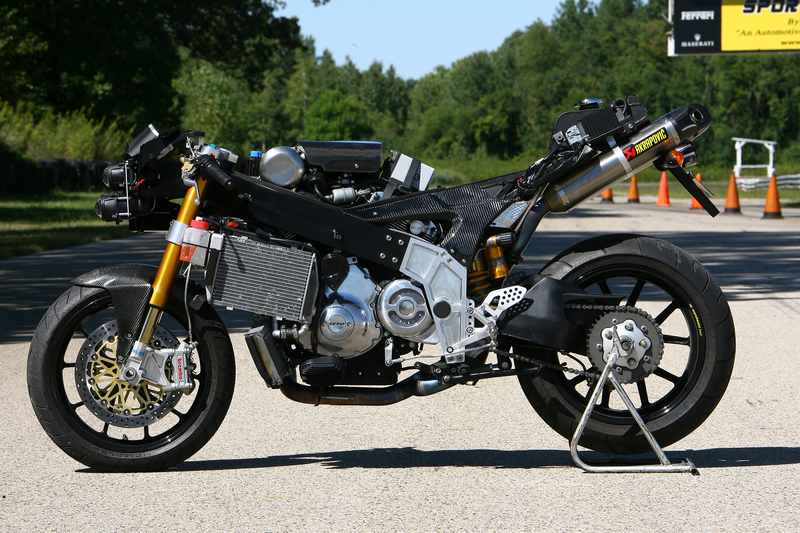 The Roehr's 1250cc Harley-Davidson V-Rod motor was originally developed by Porsche and Harley engineers around their 1990'a VR-1000 Superbike race effort. 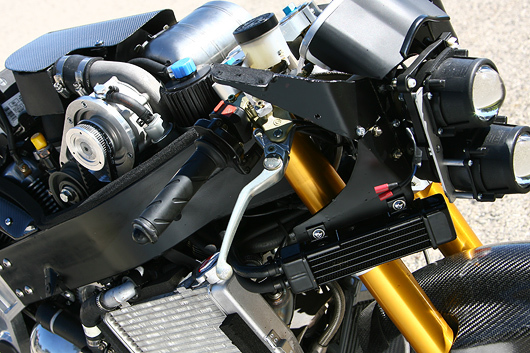 The liquid cooled, double overhead cam, internally counterbalanced 60-degree V-twin (not the H-D traditional 45-degree) engine has a displacement of 1250cc (up from the original 1130cc when introduced in 2001). But what is so very special about the Roehr modified engine is that it is supercharged! The stock V-Rod engine only puts out about 110 hp, not the power this category of high-end sportbike requires. So Roehr installs his own supercharger on the engine, running directly off the water pump drive shaft. 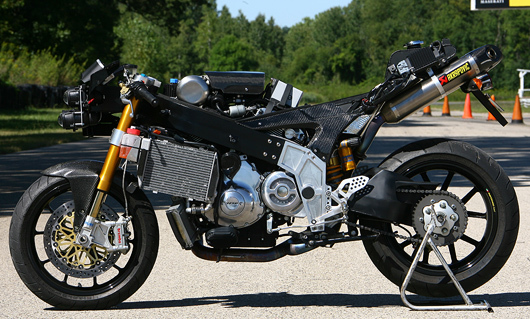 to boot it from a normally adequate 110 hp cruiser bike engine to a serious 180 hp sportbike powerplant. The water pump in turn, is replaced by a simple external electrical pimp. The result is the healthy production of broad, linear power. 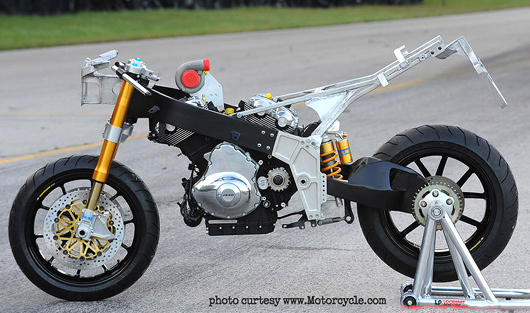 On paper, this engine is at the heart of what promises to be the most powerful American sport bike. 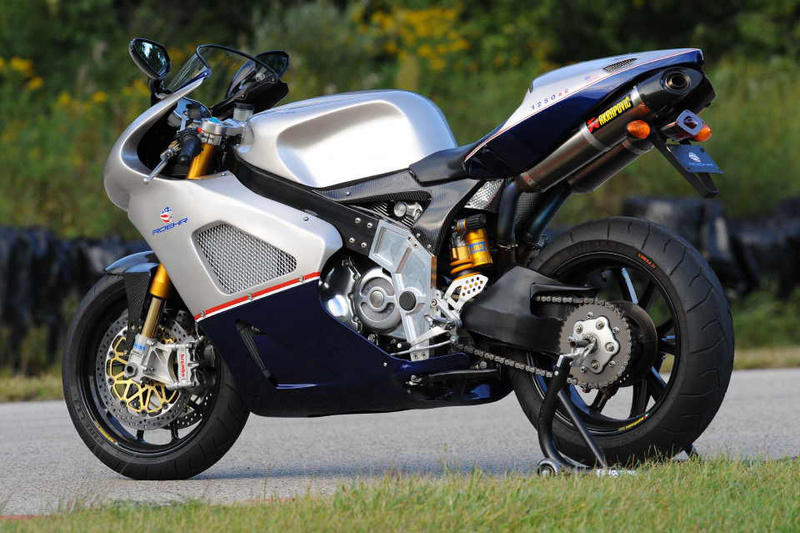 With extensive development and testing, the Roehr puts out a claimed 180 hp @ 9500 rpm and 115 ft/lbs of torque at 7500 rpm. 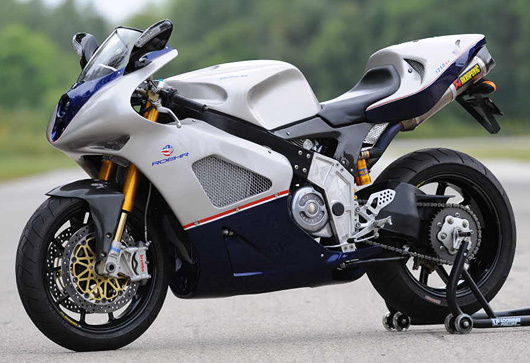 To put this in perspective, the standard V-Rod claims only 84 ft/lbs, the Ducati 1098 claims 85 ft/lbs, and the Destroyer (Harley's 6.7 second drag-bike) 97 ft/lbs. 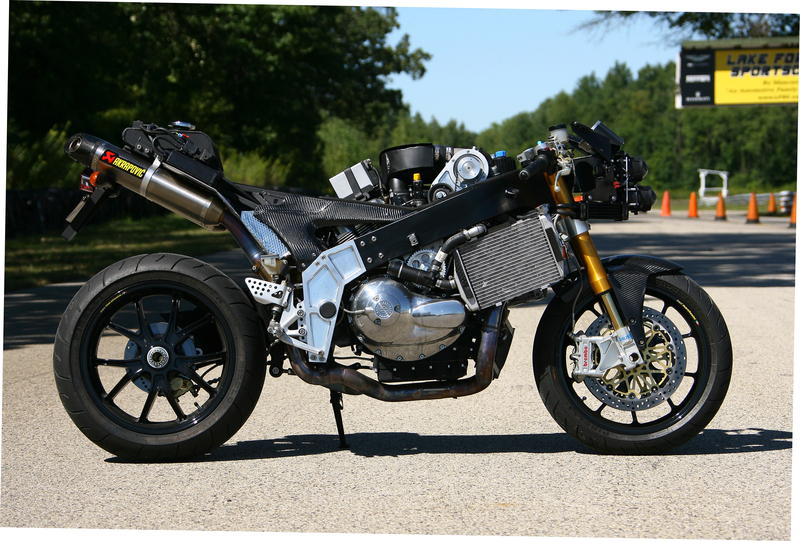 "I have been building bikes for over 15 years and now the culmination of my dreams is about one month away from final street legal approval," Roehr says. We can't help but be distracted by the 2009 Roehr 1250sc as Walter tosses us the keys for a first ride. Produced in limited numbers, this is a true American exotic with top-shelf European appointments including Brembo, Ohlins, Marchesini, and Akrapovic. The 1250cc motor fires instantaneously and idles with a refined and tamed rumble. After familiarizing ourselves with controls and gauges, the feel is familiar to other exotics we have ridden. The reach to the bars places you in forward and ready-to-sport-ride position. The seat is a bit wide but once on the pegs your legs tuck-in nicely for the anticipated speed rush. The Roehr's throttle response is flawless. It runs from just off-idle straight to redline, and bounces off the rev-limiter before you know it. It is in its powerband most of the time as it is so very wide. Deceptive as it may be, looking down at the speedometer tells the true story; this is one fast machine. All images and information on this website are copyrighted and owned by FastDates.com / Gianatsis Design and may not be used without permission. Pit Lane News uses authorized press news services with permission.